My senior year of college is coming to a close and in less than two weeks, I will be a college graduate. The thought still boggles my mind; it truly feels like last week was freshman year. Throughout my years at Champlain College, I’ve been privileged enough to study abroad in Dublin, return home and work for the Office of International Education, and learn about building my personal brand. This semester, all of this has come together and resulted in this blog, which I hope you’ve enjoyed reading. I intend to keep this blog up after school ends, and we’ll see where it takes me. This post is a reflection of my blog for this past semester, my thoughts, and my analytics that measured any sort of success I had. 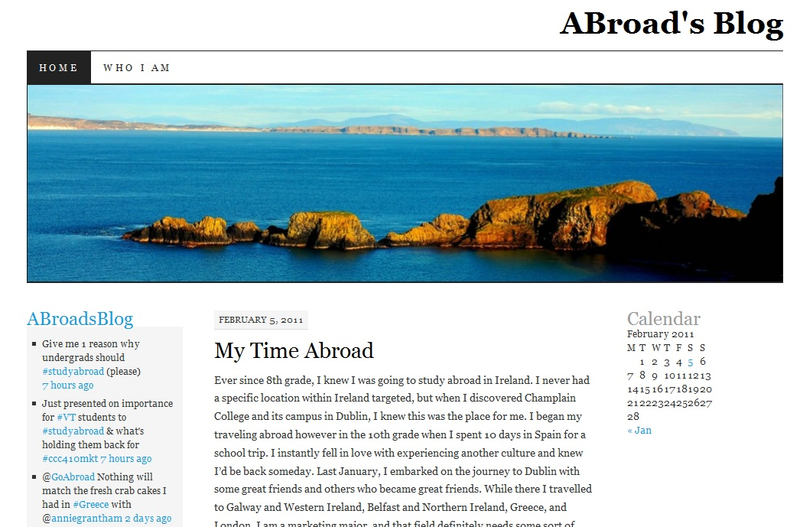 First, the layout of my blog has changed throughout the semester. I’ve used a few different templates in the beginning, decided to stick with one, and still it wasn’t exactly what I was looking for. Just recently, I switched around the look and feel to my blog, tried to make it more personal, and I’m thrilled with it’s current appearance. 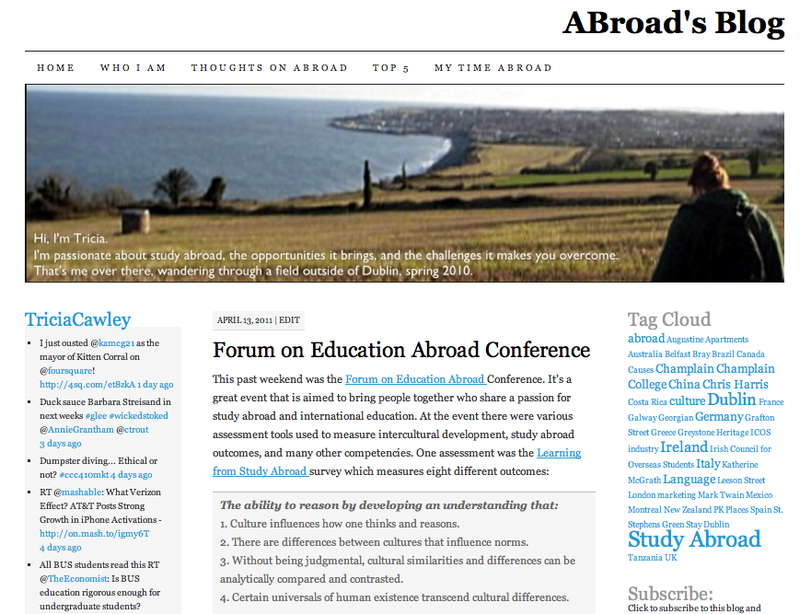 With the launch of this blog, I also launched a corresponding Twitter, @ABroadsBlog. After about a month of attempting to manage two Twitter accounts, I was advised by my instructor to really look at both accounts and evaluate whether or not the second Twitter was actually contributing to my brand. We agreed that my personal Twitter, @triciacawley would suffice for my blog, as long as I maintain the personal and professional aspects and balance them. I’ve had many great interactions with other study abroaders and different programs through Twitter, including: @zacmacinees @studyabroadalum @APIabroad @OSUGlobal -Thank you for the Twitter interaction, retweets, and feedback. For the analytics on my blog, I had to use just the basic WordPress analytics; each time I tried to install Google Analytics plugin- my blog just wouldn’t have it. Throughout my about 13 weeks managing this blog, I’ve had 915 views, averaging 10 per day. There was one day in February that made my blog seem much more popular that it actually is, because I purchased my domain name. Since I’ve purchased http://www.triciacawley.com , my views have increased. On the day I purchased my domain name, I set it as my Facebook status and the amount of views compared to the average day was ridiculous. That day I had 106 views with people copy and pasting my url into the address bar. A flaw, I realized a few hours after my status was set, was that I should have listed it as a URL so people could just click on it, drawing more traffic from Facebook. Also on that day, there were 9 links clicked on that brought traffic to other websites, including my friend’s Flickr. One of the best feelings I’ve had all semester in relation to my blog, was being mentioned on other blogs. I would occasionally be mentioned in a study abroad daily or paper.li, and very occasionally on study abroad blogs as a resource. Throughout the semester I’ve worked on this blog and produced content I am proud of. I’ve averaged 10 views a day, and the days I created posts and advertised them through Facebook and Twitter had higher views. I’ve been listed as a resource for study abroad and have spoken to strangers on the Internet about studying abroad. International education and study abroad are truly my passions and I hope that through this blog I have entertained, educated, or at least made you think a little. Thanks for your attention, and talk soon.